Summary: Do you like watching zombie movies? Do you often enjoy movies on Netflix? Now here are top 7 best zombie movies on Netflix. We also introduce you method of copying Netflix Blu-rays of zombie movies. Zombie movies are horror movies that show scary scenes and horrific activities. While some people do not like this movie genre, a lot more love it very much which inspired us to create this post on top 7 best zombie movies on Netflix 2018. You would probably find a lot of zombie movies on Netflix but are they all interesting and worthy of your time? Well, here are the very best and most interesting zombie movies on Netflix. What is the Best Zombie Movie on Netflix? Well, the question of best Netflix zombie movies ever, the best zombie movies on Netflix, and Netflix best zombie movies is very popular among internet users. In this section, we’ve given in no particular order; the top 7 best zombie movies on Netflix 2018. One of the scariest zombie movies of 2017. The train to Busan is a South Korean zombie apocalypse action thriller directed by Yeon Sang-ho. The movie centers on a train to Busan, where the zombie apocalypse breaks out and compromises the safety of the onboard passengers on the train. The plot follows the story of a convulsing young lady on board the train who bit her wound and immediately turns into a zombie. She attacked the train attendant first who also turned into a zombie at the spot. The zombie infection spread throughout the train but some passengers were lucky to escape to another car before it got to them. Few of the passengers that escaped the virus where Yong-guk a Baseball player with his crush Jin-hee and other lucky passengers on the train. Day of the Dead is an old American zombie horror film which trends as one of the best Netflix zombie movies. The movie was filmed in 1985, written and directed by George A. Romero. According to the movie; Zombies outnumbered the entire human race by 400,000 to 1. The few remaining humans hid in secure underground bunkers and barricaded camps. The scientists and soldiers that are still normal run around to come up with a collective solution that will end the zombie pandemic. Dr. Sarah Bowman, Miguel Salazar, Bill McDermott, and a helicopter pilot John flies from their hidden base to Fort Myers, Florida, to see if they can locate other survivors. They were confronted by a large horde of the undead and return to their army base. If you’re a lover of zombie movies and a Netflix subscriber, then you really need to check out this zombie movie; it is one of the best Netflix zombie movies ever. Night of the Living Deb is an American romantic zombie/comedy movie directed by Kyle Rankin featuring Maria Thayer, Michael Cassidy, and Ray Wise. Thayer acts as an awkward woman who after a one-night fling wakes up to a zombie apocalypse. Deb and Ryan try to reach her family. Along the way, Deb purposely rams several zombies but Ryan objects saying they may be treatable. After some time of little arguments, Deb agrees not to unnecessarily kill the zombies again. When was the last time you saw Wesley Snipes go against the human hunters, vampires, and zombies? Gallowwalkers is a 2012 American western zombie film written and directed by Andrew Goth. After a group of outlaws killed Aman’s lover, he hunts for them in revenge for the death of his girlfriend. Aman later killed himself and his mum who is a nun breaks her covenant with God in order to save his life; this later turned to curse on Aman and this curse is what brings him back to life as an undead. The Rezort is a 2015 British zombie movie featured among the best Netflix zombie movies. The movie is directed by Steve Barker and written by Paul Gerstenberger. Here is the story: After the human race won a devastating war against zombies, the few remaining undead are kept on a secure island, where they are hunted for sport. Sometimes later, the security of the island was bridged and the current guests will have to face a new challenging outbreak of zombies. Slasher is a Canadian TV horror series created by Aaron Martin. The eight-episode in the first season centers on Sarah Bennett who with her husband Dylan, moves back to her birth town Waterbury and into her parent’s former home. On a Halloween Night in the house, Bryan and Rachel got killed; Rachael was pregnant at the time of this murder. The baby she was pregnant with is Sarah. A 2013 zombie movie still making it to the “top- guys” list. Cargo is a very interesting Zombie movie with intriguing scenes. It tells the story of a father who has to protect his baby daughter during a zombie apocalypse. After a car accident leaves him unconscious, he wakes up to meet his wife dead and turned into a zombie. He alights from the car and drags his young daughter with him; he bids his wife an emotional farewell and leaves to check out for other survivors. Meanwhile, he had been beaten by his wife while he was unconscious. Having in mind that there is no much time till he turns into a zombie, he puts his daughter in a baby back-pack, ties his hands to a pole, and attaches carrion to the end of the pole. A while later, he collapses and then rose as a zombie. Drawn by the lure of the carrion on the pole, he continues his journey. Thinking of how to make backup copies of these Netflix movies; so you can play and enjoy them at any time without data charges on any portable media player? Here is a solution to make copies of any of these Netflix Blu-Ray Zombies movies. DVDFab Blu-ray Copy is the foremost complete Blu-ray copier, burner, and cloner available for Macintosh and Windows PC users. It losslessly copies a Blu-ray (3D included), to any DVD disc, Blu-ray disc or a hard drive easily and faster. Below are series of steps to use DVDFab Blu-ray copy software tomake copies of Netflix Blu-ray Zombie movies. We’ll try to make it a very straight-forward tutorial with no much distraction. Download and install DVDFab 10 software on your Windows or Mac PC, then launch the software and click on the “Copy” option.Then go to the copy mode switcher at the top left corner to choose a copy mode. You have five modes (Full Disc, Main Movie, Customize, Merge, and Clone/Burn) to choose. Here I take Main Movie mode as an example. Load the Blu-ray source; either a DVD disc or an ISO file/folder. After the source is loaded in, the longest title, namely the main movie, will be selected by default. Then you can change the chapters, audio tracks, subtitlesand do advanced settings according to your needs. On "Advanced Settings" panel, you can decide the output as BD 50/BD 25/BD 9/BD 5. 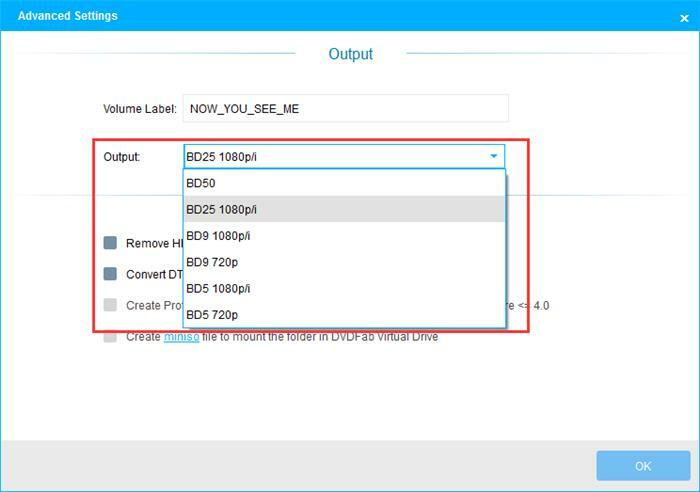 When you have set your preferences and customized your Blu-ray, now, you should choose your output storage location. Navigate to the bottom of the main interface to select a directory to save the output Blu-ray: to select your optical drive as the directory from the drop-down list box is to save the output to a blank Blu-ray disc; to select a directory by clicking the "folder" icon is to save the output as a Blu-ray folder; to select a directory by clicking the "image" icon is to save the output as an ISO image file. Hit the “START” button to trigger the copy/burning process. Depending on your settings and video size, this process may take short or long time to complete. Here are the best horror movies on Netflix that you should never miss if you love horror movies. You can also use the Blu-ray backup tool in this article to back up your Netflix Blu-ray horror movie rentals.